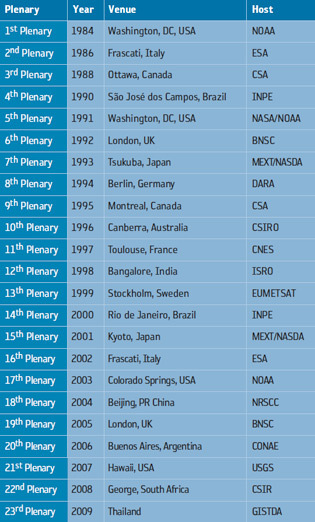 The Committee on Earth Observation Satellites (CEOS) was created in 1984, in response to a recommendation from a panel of experts on remote sensing from space, under the aegis of the Economic Summit of Industrialised Nations Working Group on Growth, Technology and Employment. This group recognised the multidisciplinary nature of satellite Earth observation and the value of coordination across all proposed missions. CEOS combined the previously existing groups for Coordination on Ocean Remote Sensing Satellites (CORSS) and Coordination on Land Observation Satellites (CLOS), and established a broad framework for coordinating all spaceborne Earth observation missions. CEOS coordinates civil spaceborne observations of the Earth. Participating agencies strive to address critical scientific questions and to avoid planning satellite missions which overlap each other unnecessarily. — to exchange policy and technical information to encourage complementarity and compatibility of observation and data exchange systems. Members: Governmental organisations that are international or national in nature and are responsible for a civil spaceborne Earth observation programme that is currently operating or has reached Phase B or its equivalent stage of system development, are eligible for membership in CEOS. — Other existing satellite coordination groups and scientific or governmental bodies that are international in nature and currently have a significant programmatic activity that supports CEOS objectives. Currently, 29 member space agencies, along with 20 other national and international organisations, participate in CEOS planning and activities. Participating agencies meet in plenary session annually, with activities and coordination occurring throughout the year. The Plenary reviews progress on the various projects and activities being undertaken within CEOS. The Chair of CEOS rotates at the annual plenary meeting. The CEOS Chair for 2008 is the Council for Scientific and Industrial Research (CSIR) of South Africa. For 2009, the Geo-Informatics and Space Technology Development Agency (GISTDA) of Thailand will undertake CEOS chairmanship. — the Japanese Ministry of Education, Culture, Sports, Science and Technology (MEXT) jointly with the Japan Aerospace Exploration Agency (JAXA). The Secretariat is chaired by the current CEOS host organisation in support of the CEOS Plenary. As part of the ongoing contribution to CEOS Secretariat activities, ESA is responsible for the CEOS Handbook, NASA for the CEOS Annual Report and Web site content, and MEXT/JAXA for the CEOS Newsletter, Brochure and maintenance of the Web site. ESA currently funds the engagement of a fulltime post to increase the capacity of the CEOS Secretriat, particularly with regards to the relationship with GEO (Group for Earth Observations). This post, the CEOS Executive Officer, is funded by ESA through to the end of 2009 (see below). — The Atmospheric Chemistry Subgroup. Working Group on Information Systems and Services (WGISS): The objective of WGISS is to facilitate data and information management and services for users and data providers in dealing with global, regional, and local issues. In particular, it addresses the capture, description, processing, access, retrieval, utilisation, maintenance and exchange of spaceborne Earth observation data and supporting ancillary and auxiliary data and information, enabling improved interoperability and interconnectivity of information systems and services. WGISS meets approximately every six months. There are two subgroups of WGISS: ‘Technology and Services’, and ‘Projects and Applications’. WGISS has started a new initiative called the WGISS Test Facility which offers a framework for partnership with selected international science and EO projects to test and develop information systems and services to meet their requirements. The Global Observation of Forest Cover (GOFC) international science project was the first test of this concept. More recent projects include WTF–CEOP (WGISS Test Facility for Coordinated Energy and Water Cycle Observation Project), which aims to provide assistance to the CEOP science community in the development of data services associated with satellite data integration. Working Group on Education, Training and Capacity Building (WGEDU): The CEOS Working Group on Earth Observation, Education, Training, and Capacity Building (WGEdu) has developed a strategy for EO education and training in order to establish an effective coordination and partnership mechanism among CEOS agencies and institutions offering education and training around the world. The key objective of the strategy is to facilitate activities that substantially enhance international education and training in Earth System Science and the observation techniques, data analysis and interpretation required for its use and application to societal needs. The Group has developed a CEOS education portal to provide easy access to data sets available for these purposes. 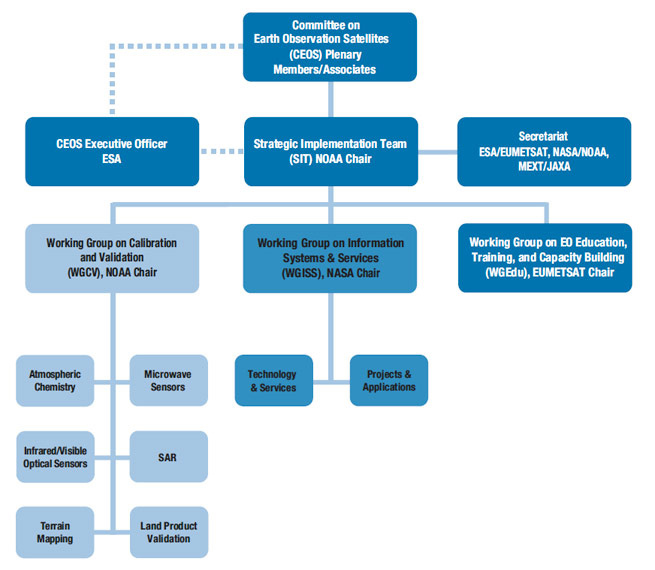 CEOS has established a Strategic Implementation Team (SIT) which is responsible for addressing implementation issues – notably those related to the space component of the Global Earth Observing System of Systems (GEOSS). The SIT provides a forum where the heads of space agencies can meet to develop agreements on programme commitments in order to address gaps or overlaps in mission planning. Progress towards the GEOSS space segment is monitored and managed using the CEOS Implementation Plan, which is maintained by the SIT Chair and updated annually for the CEOS Plenary. In 2008, the SIT is chaired by NOAA. JAXA is currently Vice-Chair and will commence its 2-year chairmanship in late 2009. The post of a full-time CEOS Executive Officer (CEO) was agreed in late 2006 to bolster the resources available to CEOS. The post is funded by the European Space Agency for an initial period of 3 years. The Executive Officer is charged with ensuring the efficient conduct of the CEOS contribution to GEO – including the implementation of the response to the GCOS IP (Implementation Plan for the Global Observing System for Climate), the GEO Work Plans, and development of the CEOS ‘Virtual Constellations for GEOSS’.